A Bangladeshi man kidnapped by Indian workers in Lebanon was the victim of a ransom plot, Lebanese internal security forces said. The 41-year-old worker was kidnapped as he was heading to work in the coastal region of Jounieh. Security forces identified the vehicle used in the kidnapping and raided a property in the Ghazir district the following day. The kidnap victim was found blindfolded and handcuffed inside a bathroom. Two 31-year-old Indian nationals were arrested at the property. The 33-year-old ringleader of the gang was arrested in the nearby town of Kafr Habab. The three men told security forces they carried out the kidnapping as part of a ransom plot. During the investigation, the kidnap victim said he had been tortured by the kidnappers, who attempted to hang him after demanding his girlfriend pay a ransom. Security forces said the kidnapping last month highlighted the ability of overseas workers to form active gangs. Last March, security forces broke up a Bangladeshi network selling a drug known as yaba — tablets containing a mixture of methamphetamine and caffeine. 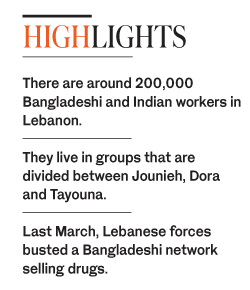 Use of the drug is rising among the Bangladeshi community in Lebanon and has started to spread among young Lebanese, according to security forces. Bechara Asmar, president of the General Confederation of Lebanese Workers, estimated there were 200,000 Bangladeshi and Indian workers in Lebanon. “They are self-contained communities and live in groups that are divided between Jounieh, Dora and Tayouna,” he told Arab News. “These workers are being recruited to work in petrol stations, supermarkets, parks and environmental businesses,” Asmar said. Some of these workers are craftsmen who work in carpentry, the aluminum industry and embroidery. A security official said the three detainees in the kidnap case will be referred to the Lebanese judiciary for trial. The three will not be extradited because the alleged crime was committed on Lebanese territory.